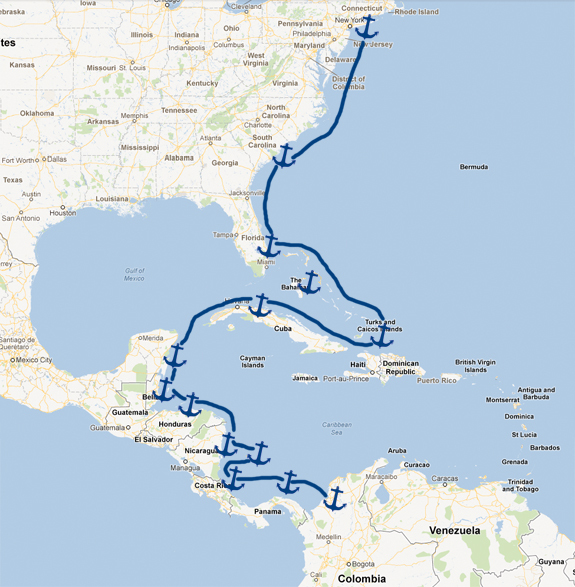 While preparing to sail is really a lot of work, we’ve had a lot of fun thinking about where exactly we’ll be making stops along our journey. Visions of crystal clear water and blue skies provide a bit of zen while we’re both completely stressed out about the amount of stuff we have left to do. I’m fully aware that our path could easily change based on the winds, but as of now we’ve got some pretty fun places lined up to check out! We originally wanted to stop all along the coast of the States on our way down, but now that the temperatures are quickly dropping we plan to make it through the US as quickly as possible. We’ll be making one stop in Charleston as we both would love to spend some time there. We’ll be sure to say hi to Johnny at The Glass Onion during our explorations as well. Then, it’s down to Florida to spend some time with my family and friends and do a little provisioning. After that, the real fun starts! We hope to make stops in the Bahamas, Turks & Caicos, Mexico, Belize, Honduras, Nicaragua, Providencia, Costa Rica, San Blas Islands and more! Then, it’s off to Colombia. I’m getting so excited just typing it out! If you’d like to escape the winter weather and meet us somewhere warm and beautiful – give us a shout. We like having friends around. Leave a comment below to claim your country! I keep hoping maybe I’ll be in Charleston when you stop by! I’m so excited your going to get to go to his resturant! He’s super excited! If not, we’ll be in Florida after that!